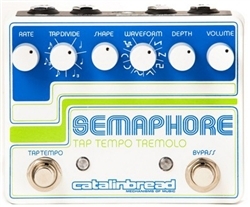 The newly redesigned Catalinbread Semaphore combines a fantastic audio path, with a diverse tremolo that has a bottomless feature set including 8 different waveforms, tap tempo and divide, tap tempo input, and expression pedal capabilities. It's small footprint combined with a feature set that suits both foot tappers and knob twiddlers alike, makes the Semaphore both versatile and pedalboard friendly. At the heart of the Semaphore is a lush audio path that incorporates optically controlled JFET gain stages to sculpt a gorgeous clean boost sound, that is present and alive without being peaky or harsh. Catalinbread quadrupled the number of waveforms, everything is in there from classic square, triangle, and sine waves to ramping sounds, and a mind-bending random shape. And in conjunction with the Shape contour, which morphs the waveshape, numerous waveforms are waiting to be unlocked. The Semaphore sounds fantastic, and the Tap Tempo section is engaging and easy to use. Catalinbread even included a control voltage input to control the tap tempo with another unit.